This shooting board was in the 2017 June issue of Fine Woodworking (issue #261). I had planned on “making it some day”. Well I actually have a need for this on a current project, so I went ahead and made it yesterday. The construction materials are 3/4” Baltic Birch and Lyptus for the fence and runway. The overall dimensions are 15”x18”. The fence and runway are finished with wax. It took a little fiddling with the fence to get miters 90 degrees to the edge. 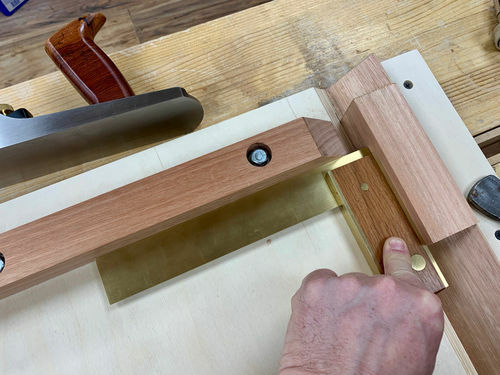 But once set, it’s cutting clean 45 degree miters perpendicular to the long edge. The design allows for any adjustments that may be needed due to seasonal movement. Very nice. Looks like a very useful fixture. Necessity somehow speeds things up, have been thinking about this style shooting board since getting my Veritas? Can never have too many shooting boards:) Good job! 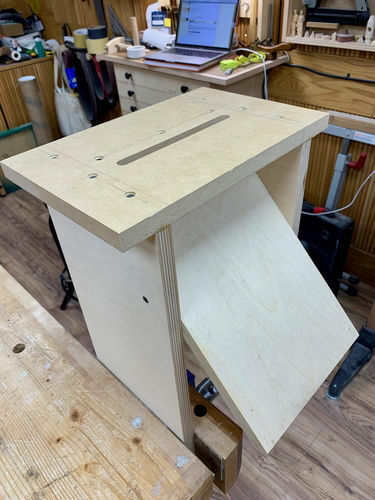 First need to make new drill press table? nice bill anything that makes woodworking better is worth doing. Andre I liked this style too. I think it may have more versatility because the plane can register against the side vs the sole. 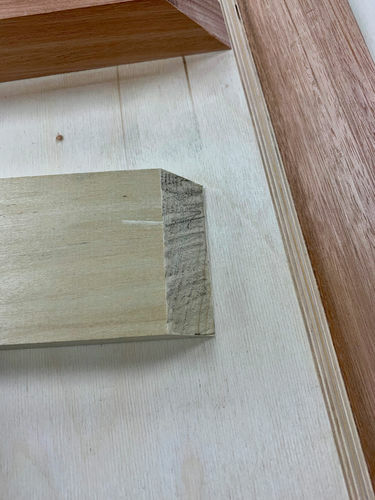 I’m attempting, well I think I’m attempting :O, hidden mitered dovetails. 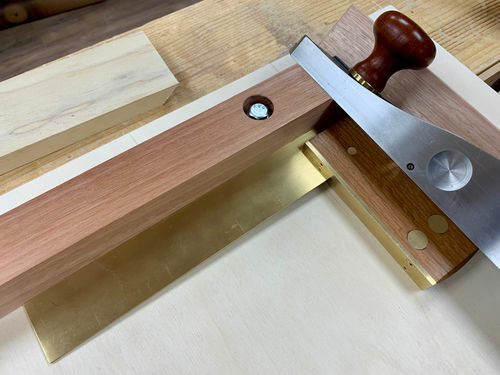 I can use a shoulder plane to bevel the end of the board. I just need the correct shim to do so and it works just like using any other shooting plane. 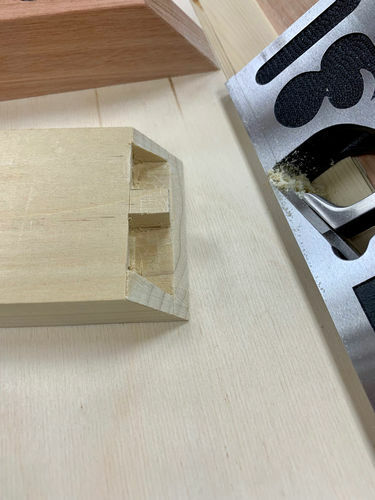 It will clean up right to the underside of the pins or dovetails. your way too modest bill. Really nice work. I like the hidden dovetails too. Nice, Bill. 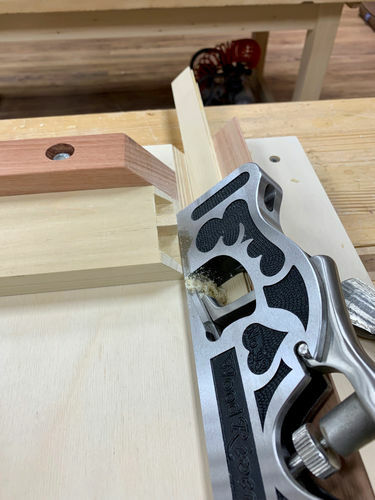 I prefer my miter jack, but I think that’s more a matter of personal taste than anything else. But this shooting board will get used on this project or another. Actually I will probably use both on the console. This one to true up the miters and the other for the joinery. Edit to add: plus about $25 shipping. It’s good to know the market value for a miter jack. I’ll have to keep my eyes out this spring. I get that, Bill. I’m not retired just yet, so I have more money than time for a little while longer. I want to do a followup for anyone that is considering making this shooting board. Squaring the fence to the runway is going to be the most difficult and frustrating part of this build. 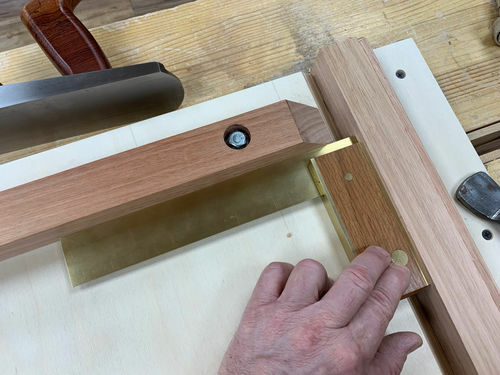 The instructions offered in the Fine Woodworking article suggest doing this on a trial and error basis by making matching miters with the shooting board and then checking them for square against the fence. That seemed to be an effort in futility. It’s very easy to overcompensate and then have to reposition the fence over and over again. So I did the following and it simplified the matter in one try. First I loosened the fence and placed the off cut of my ramp in the mitered groove between the ramp and the bed. This gave me a flat, perpendicular surface to place my square against. 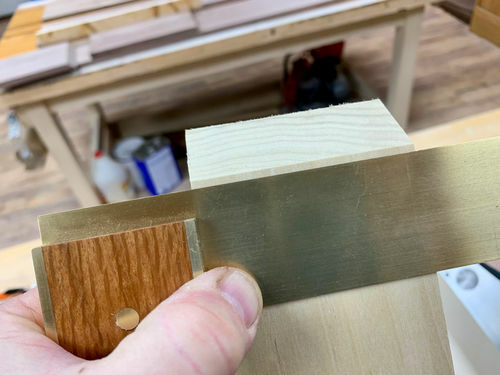 I also checked it against a piece of the ramp that was cut off the end to make it shorter, which you may or may not have depending on the length of stock you initially use for this. I made mine longer than needed for the bed. Then I checked for square against the most important component – the sole of my plane. And then I finally made a test by darkening the end of the board to be mitered with a pencil to be sure I was cutting the end fully with the plane. And then to check the results I place the square against the edge that was against the fence to be sure the miter was square to the reference edge. If you look at the build instructions, the author uses a plastic triangle placed against the ramp and the fence. This is ok to get you in the ballpark, but it’s not good enough for accuracy. Also the back and forth testing/adjusting is too hit and miss. Other than that, the build is nice because if there are any adjustments necessary after the fact, nothing is glued so you can remove/redo/replace components if you find things aren’t working. I found I needed to remove the fence and square up the bottom to the reference side as I didn’t do a good job of it the first time.